An unrelentingly grim affair, Unbroken excels at its realistic portrayal of dehumanization, but fails to capture the indomitable spirit of its protagonist. Angelina Jolie’s film is an impressive technical achievement, and her hero’s journey is undeniably gripping, but there aren’t enough bright spots to warrant a trip into this kind of darkness. Simply put, this amazing story is the stuff of documentaries, not a glorified passion play. The first chunk of Unbroken, which focuses on Zamperini’s rebellious youth, works quite nicely. Particularly riveting is the time spent aboard the bomber plane. Here, Jolie expertly captures the excitement, bravado, and terror required to survive life under fire. Through a series of flashbacks, we see the source of Louis’ mental toughness; a toughness that sustains his will while others around him are broken. We get a sense of the fire burning within Zamperini, stoked largely by the unending support of his older brother Pete (Alex Russell). Sadly, the script sticks to generalities and painfully mannered dialogue. We are told exactly what everyone is thinking—every emotion, fear, and ambition—in the most straightforward way possible. Still, the action scenes are stellar, and we get enough background to understand that Louis is a man who could conceivably endure the torment yet to come. The time spent on the raft, too, is effectively harrowing without becoming too melodramatic. It’s a methodical battle for survival, told from a refreshingly matter-of-fact perspective by Jolie and her cinematographer, Roger Deakins. You can question the artistic merits of Unbroken, but it never looks less than spectacular. Jolie was wise to enlist a legend like Deakins for a production with very few shooting locations. Deakins keeps locations looking new and fresh long after we’ve memorized the grimy landscape. Despite the moderate success of the film’s first half, Unbroken quickly implodes after Zamperini arrives at the POW camp. The primary culprit is a script (co-written, shockingly, by Joel and Ethan Coen) that has absolutely no idea how to build toward its emotional climax. Instead of continuing to learn about Zamperini, or forging new and inspirational relationships within the camp, we are repeatedly battered by the same, tired story beats. Even the piece’s chief villain, an insecure jailer known as ‘The Bird’ (Miyavi Mutsuhiro), fails to engender any real sense of dread. Yes, he is a terrifying figure that we come to despise, but he’s presented as little more than a mustache-twirling sadist. There are hints of depth and substance, but this pivotal relationship between The Bird and Zamperini is woefully unexplored. We’re even treated to the lazy cliché of “We aren’t so different, you and I.” This sort of bland, uninspiring explanation may work in a fictionalized Bond universe, but it’s insulting under these real-world conditions. In fact, Zamperini is unforgivably passive in the film’s second half. Instead of expounding upon the themes established in the first half—the unrelenting fire burning within Louis—he simply becomes a punching bag. We watch helplessly as he’s mercilessly beaten again and again. The only normal human response to watching such brutality is to separate from it emotionally; we become observers instead of stakeholders. Because the filmmakers fail to keep us hooked into Zamperini’s inner struggle, there’s nothing but a queasy feeling of relief when his ordeal is finally over. His ultimate perseverance, though admirable, fails to inspire as the filmmakers had intended. It’s clear that Jolie and her writers have nothing but the best of intentions. Louis Zamperini is a hero who deserves to be honored for his service and his sacrifice. While Unbroken takes great pains to get its facts right, it reveals nothing about the human spirit. 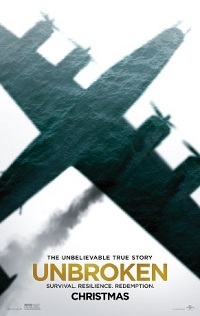 What’s missing is the voice of Zamperini, who becomes a passive participant in his own story. His amazingly full life is distilled down to mindless brutality and suffering. Unlike Zamperini, however, we have the option of avoiding the misery.